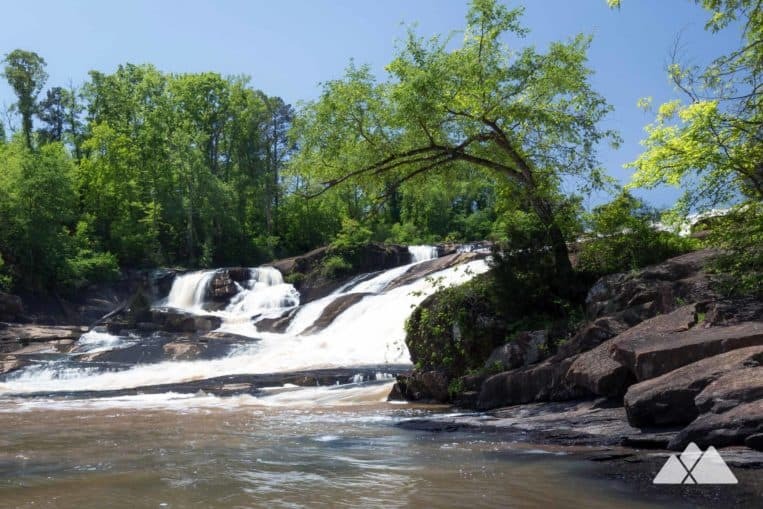 High Falls State Park is a popular warm-weather outdoor destination, well-loved for its glassy lake, broad spillway dam and an enormous, multi-tiered waterfall. 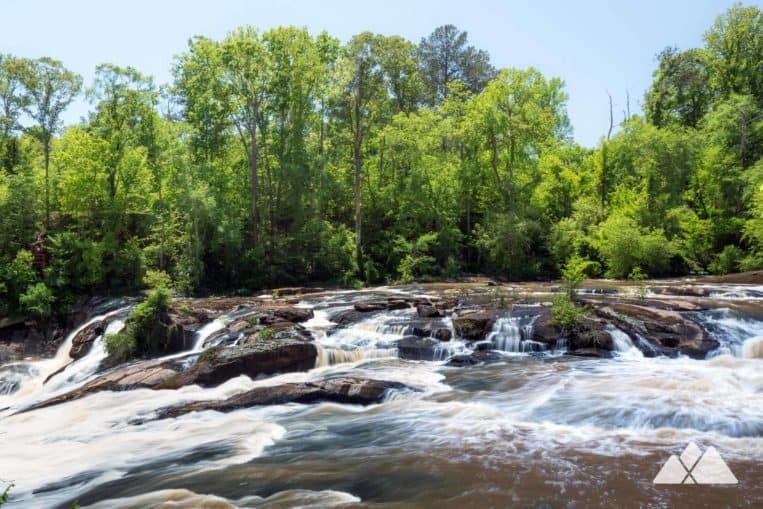 Nestled in a shady forest just north of Macon, the Towaliga River tumbles through the park, churning in whitewater and free-falling cascades over massive rocks and boulders. And while these incredible falls are partially visible from the park’s bridge, the views are much more impressive from the Falls Trail, our favorite hike in the park. This ultra-scenic adventure explores the river’s eastern banks, descending into a rocky, boulder-filled forest. 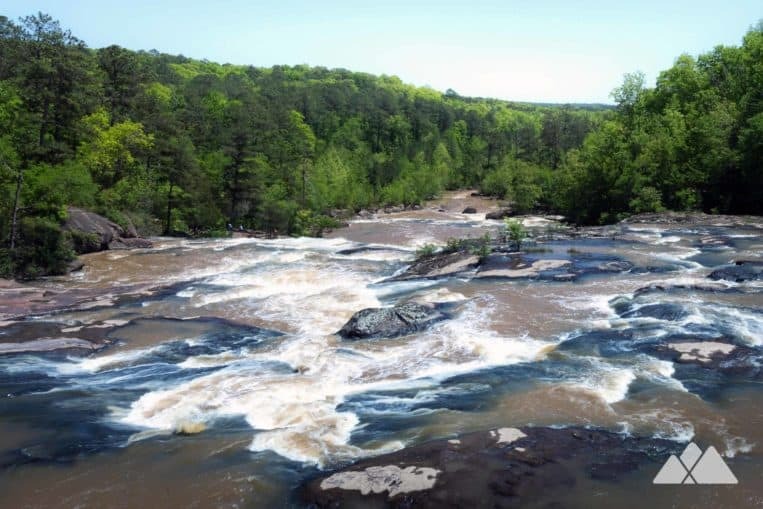 The hike follows a double loop, exploring the shore of the waterfall-filled river before looping through a shady forest. It’s a beautiful, moderately challenging route, and the spectacular views make this one of our all-time favorite hikes near Macon. 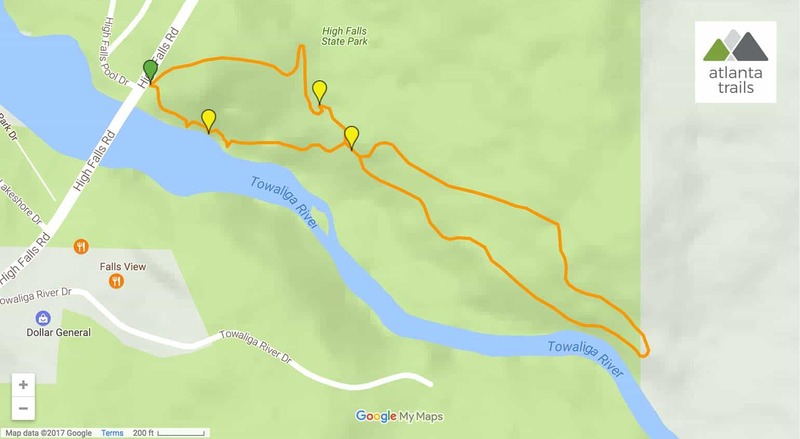 The adventure begins at a signed trailhead on the river’s northeastern shore, just downstream from the dam (view maps and driving directions). The trail descends a series of wooden platforms along the river, catching increasingly better views of the huge, whitewater-filled waterfall. The hike continues descending elevation along the river. The roar of the enormous waterfall and rushing water echoes loudly along the trail, as large rock outcrops and boulders dot the forest floor, as pine and deciduous trees shade the trail overhead. The views of the falls are incredible and striking, with tumbling chutes and spilling tendrils of gushing whitewater channeling through the rocky valley. The hike soon reaches a sandy shore framed by large boulders. Multiple waterfalls spill over the river’s rocky, angled bed, cascading in streams of tumbling whitewater into heavily-churned pools below. The hike crosses a small wooden bridge before beginning the hike’s southern loop section, continuing to follow the trail’s red blazes. The hike veers from the river, crossing a small stream and venturing through the forest, and then rejoining the notably-calmer river downstream. The hike arcs northbound at .5 mile, gaining elevation through the forest. Though it’s now out of sight, the waterfall’s roar remains audible as the hike climbs a ridge to complete the trail’s lower loop. Reaching the upper loop, the hike veers right to climb through a rocky forest, crossing between several massive, angular boulders. 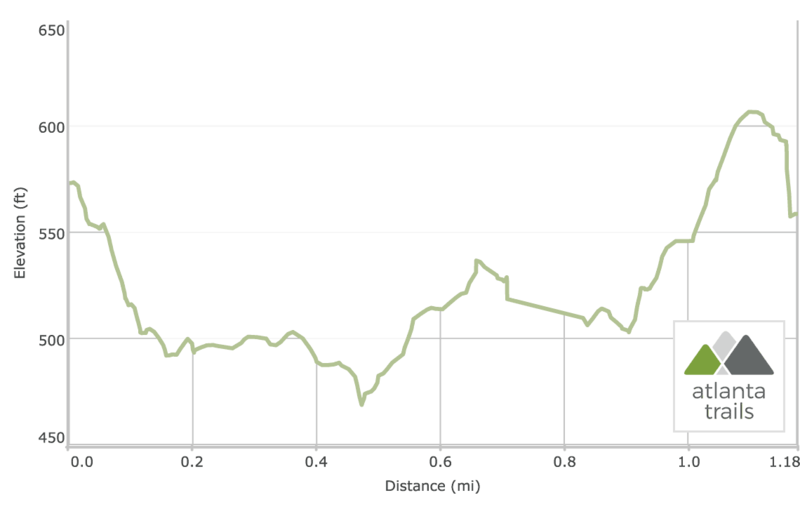 The trail climbs elevation steadily toward the trailhead, passing a wooden bench at one mile. The hike reaches the trailhead at just under 1.2 miles, completing this ultra-scenic adventure. 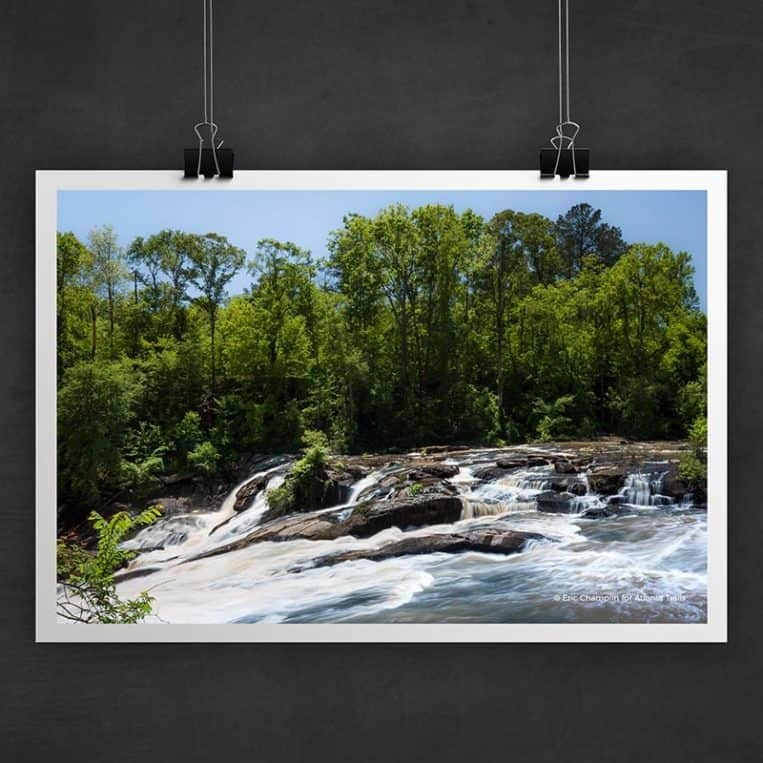 There are two stunning waterfalls with the same name in North Carolina, and both are well worth a visit if you’re in the Asheville area. Hike to High Falls at DuPont State Forest, one of many waterfalls in this stunning park near Brevard, NC. And don’t miss the tumbling, towering High Falls at Lake Glenville near Cashiers, another exceptional NC waterfall hike.